What challenges are you prepared to take on? This is the question that Master and MBA students ask themselves during the modules held in the newly-remodelled Collbató Residential Training Campus outdoor training area. EADA is the only European school with such complete outdoor training facilities designed to develop strategies for overcoming challenges and taking action as well as promote the importance of personal and shared values. According to Carles Brugarolas, Professor and Head of the Department of Strategy, Leadership and People at EADA, participants’ fears and limitations are tackled with help from classmates. 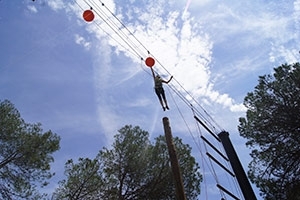 “The outdoor training activities are action-oriented and develop skills such as self-confidence and trust in others, self-control, cooperation and collaboration, and the ability to assume risks and start new projects,” he says. Moving forward in an activity often depends as much on decisions taken by the team as a whole as the skills of the individual students. The outdoor training activities allow participants to experience the strategic decisions that must be taken in a company. Brugarolas confirms that the activities are especially effective at developing the skills that today’s future business leaders need: “It’s the perfect way for participants to test their managerial skills – it’s always the participant who makes the final decision to take part in any given exercise or activity, and he decides what his participation will look like and how much of a challenge he is willing to take on.” Students receive expert feedback after each activity and each exercise is recorded, so it can be played back later. The immediate feedback, as well as the opportunity to see the exercise again, is key to enhancing skills and changing attitudes. According to Brugarolas, the activities help students learn how to delegate effectively in their company or how to present themselves with the self-confidence to kick-start new initiatives. (Originally published on the EADA web site in News).